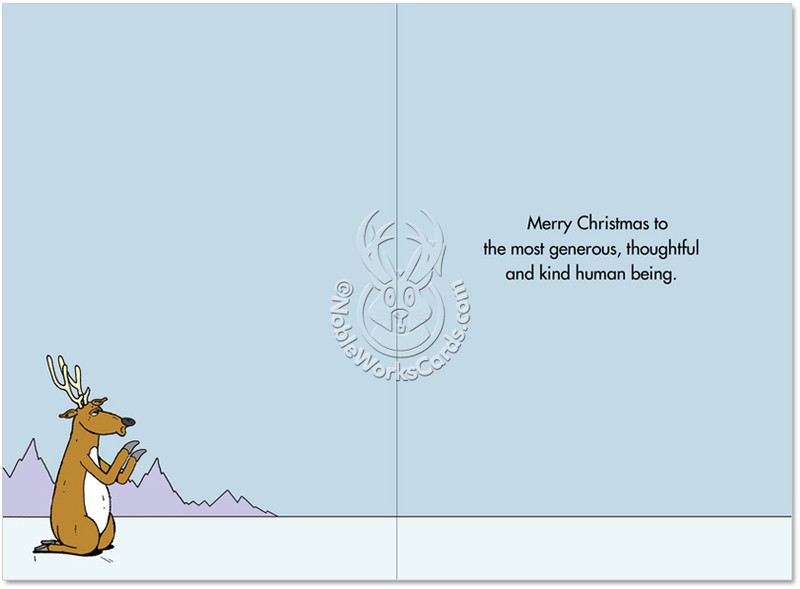 Cover Reads: Thank You, Sir, For Giving Me The Opportunity To Guide Your Sleigh... You Are Truly A Most Generous, Thoughtful And Beautiful Human Being. (Image Caption) Contrary To Popular Belief, Santas Favorite Was Actually A Brown-Nosed Reindeer. Inside Reads: Merry Christmas To The Most Generous, Thoughtful And Kind Human Being. 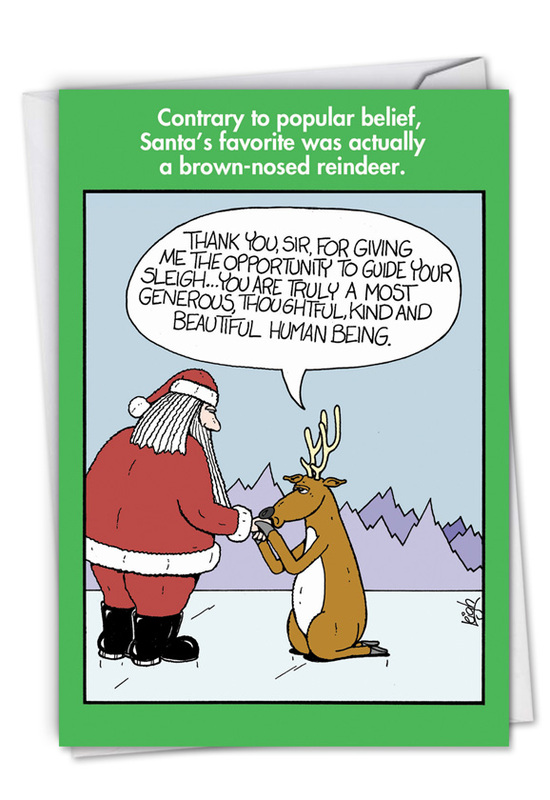 We all know the story of Rudolph the Red-Nosed Reindeer. But everyone should know about who is truly Santa’s favorite. 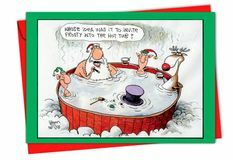 This hilarious Christmas card is drawn by Leigh Rubin, creator of “Rubes,” which appears in hundreds of newspapers across the country. 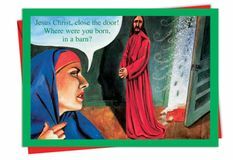 It is SFW and instantly recognizable to anyone who has ever had a job, making this a perfect Christmas card for co-workers, Secret Santas, office parties and other work events. 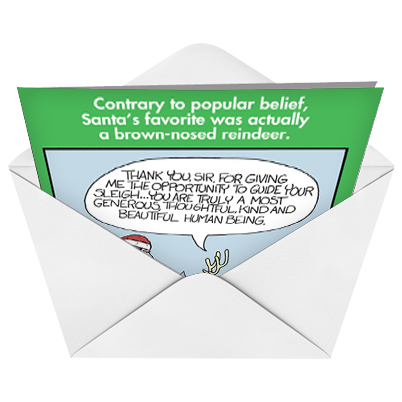 This hilariously irreverent holiday card from NobleWorks Cards is perfect for brown-nosing family members and co-workers, as well. It’s available in regular and jumbo versions, so everyone can clearly remind themselves about office kiss-asses. And the more you buy, the bigger bulk discount you get, so what the heck — add those other floors and departments to your Christmas card list this year. She couldnâ€™t stop laughing. Price less than most similar cards in local stores. Nicely packaged. This card is funny for the right friend, or co worker! ProsColorful humor. Quality of card good for the price, too. ConsIf you haave a good sense of humor, really no con.